Pnoi Suites situated in Karterados, one of the most beautiful villages in Santorini both picturesque and just five minutes walk from the city center and the famous caldera view. Our loyalty in offering unique services in breathtaking destinations came true once more with this complex of two amazing suites. Each suite consists of one bedroom, a living room with a fully equipped kitchen and a private bathroom with shower, designed with a combination of elegance and rustic elements. 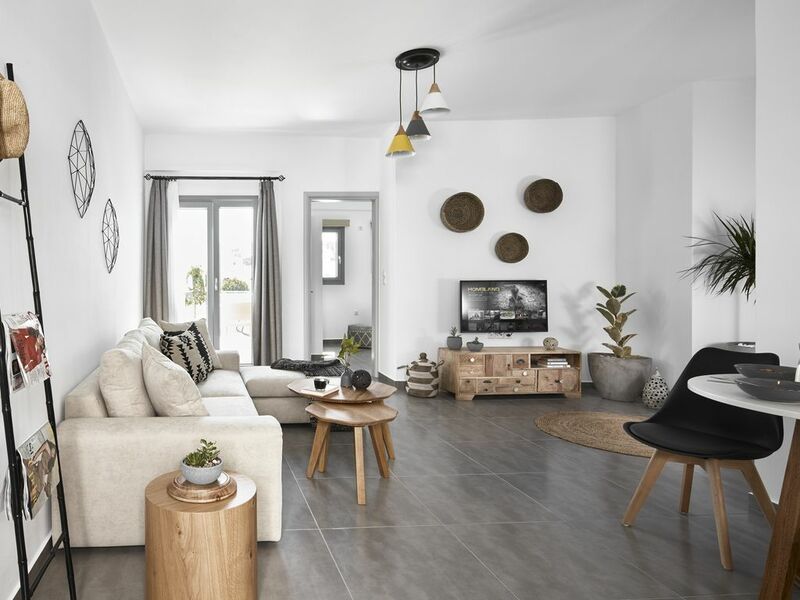 The apartments are fully airconditioned and equipped with smart tv, free wi-fi and other home appliances to reassure you will feel completely independent during your stay. The diferrence between those architectural gems is that the apartment with split level can host up to 4 guests whereas the one bedroom apartment can sleep up to 3 guests. There is a private beautifully furnished balcony for each suite, with amazing ocean and village view that promises both body and soul relaxation. The sunrise from this part of the island is , as many guests have quoted, even better than the sunset. Featuring every comfort you could possibly want to make yourselves feel completely at home in your own private house and their children friendly structure make it an incomparable choice for both families which travel with kids or couples.